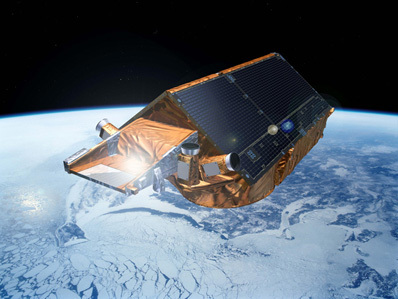 Taking advantage of a second chance rarely afforded in the space business, a team of European scientists will launch the CryoSat 2 satellite Thursday to measure how fast Earth's polar ice sheets are melting. A Dnepr rocket will blast off from Kazakhstan at 1357 GMT (9:57 a.m. EDT) Thursday. Sixteen minutes later, the 112-foot-tall booster will release the 1,587-pound satellite into a polar orbit designed to regularly carry CryoSat 2 over the Arctic and Antarctic ice caps. See our complete launch timeline for more details. CryoSat 2's operational orbit will be 445 miles high with an inclination of 92 degrees, according to the European Space Agency. The launch will come more than four years after a similar spacecraft fell back to Earth during a launch mishap in 2005. 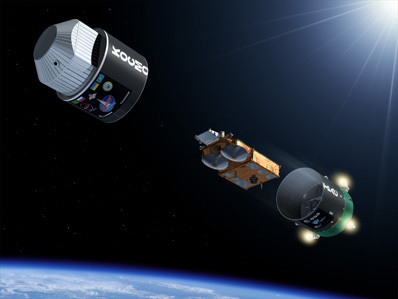 Officials said the second stage engine on the Rockot launch vehicle did not turn off on schedule, causing the second and third stages to remain attached, dooming the mission. "This time around, all of us will be all too familiar with the idea that launches can fail," said Duncan Wingham, CryoSat 2's lead investigator. "We should be less relaxed than last time. Space is a risky business. You spend many years building these things, then you stick them on a tube of high explosives and you put a match to it." ESA and CryoSat's science team immediately began lobbying to build a replacement satellite. "In the early hours after the failure, I came to recognize that my job description had changed," Wingham said. "It wasn't to exploit the data, it was to rejustify the mission. Within hours, I took that issue up with the space agency." ESA's Ministerial Council, consisting of representatives from the agency's member states, considered the proposal during a meeting a few months after the launch failure. Final approval for CryoSat 2 came about four months after its predecessor crashed into the Arctic Ocean, according to Richard Francis, the mission project manager. Scientists and politicians both recognized the importance of CryoSat and concluded a new mission should go ahead, Wingham said. "We had this mission that was completely justified and deserving, so there was great goodwill among the upper echelons of ESA to rebuild it," Francis said. CryoSat 2's radar altimeter will map land and sea ice with enough precision to detect how much ice mass is being lost. The data will improve the understanding of how the ice sheets affect climate and rising sea levels, according to scientists. "Although, on the day the failure, I feared that I had a mountain to climb, it turned out not to be that way," Wingham said. "It proved a much less difficult task than I had imagined 90 minutes after the failure." The mission's cost is 140 million euros, or $187 million under current exchange rates, according to ESA. Francis said engineers made 86 changes from the old satellite during the development of CryoSat 2. The most visible change is the addition of a second radar instrument named SIRAL to give the CryoSat 2 payload full redundancy in case the primary sensor fails. "The first one was completely non-redundant and was susceptible to any single-point failure," Francis said. "With a rebuild, we couldn't afford that." Officials also updated the spacecraft's software, added a new communications system, and increased the size of the flight batteries, according to Francis. ESA also selected a new rocket to launch CryoSat 2, turning to the Ukrainian Dnepr booster, a modified Soviet-era SS-18 ballistic missile. The Dnepr is sold for international and commercial launches by Kosmotras, a company chartered by the Russian and Ukrainian governments. The Dnepr will spend the countdown inside of an underground silo at the Baikonur Cosmodrome. Controllers at the European Space Operations Center in Germany will start the countdown eight hours before launch at 0557 GMT (1:57 a.m. EDT). CryoSat 2 will be powered up six hours before blastoff to begin a series of health checks ensuring it is ready for launch. The primary control team will begin their shift at ESOC around 1157 GMT (7:57 a.m. EDT). The satellite will be placed in launch mode at 1217 GMT (8:17 a.m. EDT) and will be put on internal power at 1307 GMT (9:07 a.m. EDT), according to ESA. The Dnepr rocket team will evacuate the launch pad about a half-hour before liftoff, and the booster's automatic sequence will start at T-minus 15 minutes. ESA's last chance to call an abort is five minutes before launch. An official inside the Dnepr launch control center will push the "start" button at T-minus 2 minutes, 56 seconds. When the countdown clock reaches zero, the Dnepr rocket's guidance system will lock into its inertial navigation mode while the launcher is still in its underground silo. "The actual black powder ignition, which shoots the missile out of the silo, happens about five seconds later," Francis said. "That's the visible launch." The Dnepr first stage's RD-264 engine will ignite as the rocket is suspended nearly 100 feet above the ground, quickly ramping up to nearly 1 million pounds of thrust to propel the launcher skyward. The first stage will be jettisoned at T+plus 1 minute, 50 seconds and the payload fairing should be released at T+plus 5 minutes, 9 seconds, according to ESA. After completing its role in the launch, the Dnepr's second stage will separate from the third stage nearly six minutes after liftoff. The Dnepr's third stage will make a 180-degree turn a few moments later to drag CryoSat 2 into orbit in a backward orientation. The rocket's designers conceived the unusual approach to improve the missile's accuracy during wartime. "If you look at the statistics for the Russian missiles, it's the one that has the highest accuracy," Francis said. CryoSat 2 will remain inside a protective canister during the third stage burn to prevent contamination from the engine's exhaust cloud. "With a satellite, that could cause some unpleasant thermal effects, not to mention pollution, so the spacecraft remains in this gas dynamic shield right up until shortly before separation," Francis said. "So there's no possibility of a signal from the spacecraft because it's inside a metallic enclosure." The spacecraft will separate from the Dnepr third stage at T+plus 16 minutes, 28 seconds. A communications site in Malindi, Kenya, should acquire the first radio signals from CryoSat 2 about 17 minutes after launch. A Norwegian ground station named Troll in Antarctica will attempt to contact the satellite a half-hour into the mission. Francis said CryoSat 2's solar panel and radar antenna are fixed, eliminating risks posed by deployable appendages. If all goes well, the control team will power up Cryosat 2's SIRAL radar over the weekend and the first test results could be available by around Monday. It will be six months before engineers finish commissioning the satellite and hand it over for scientific use, Francis said.